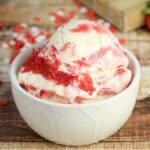 Strawberry Poke Cake - Frugal Mom Eh! 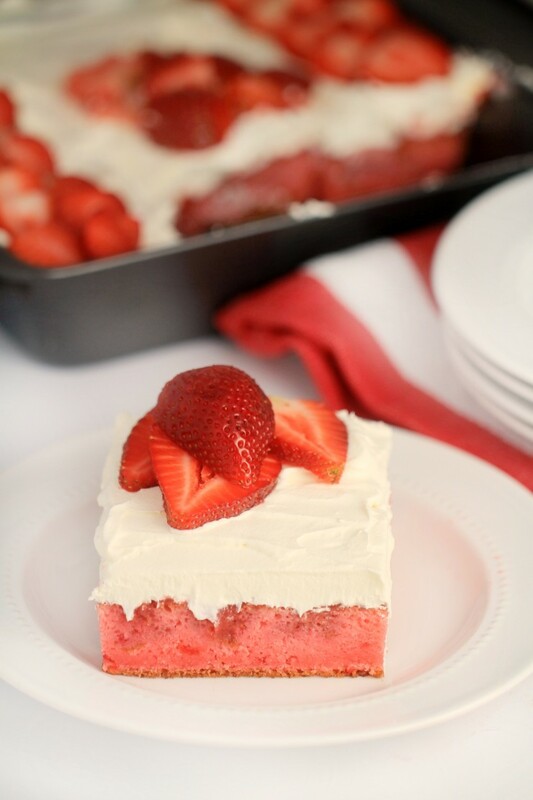 This strawberry poke cake is a delicious twist on that classic summer treat – strawberry shortcake. 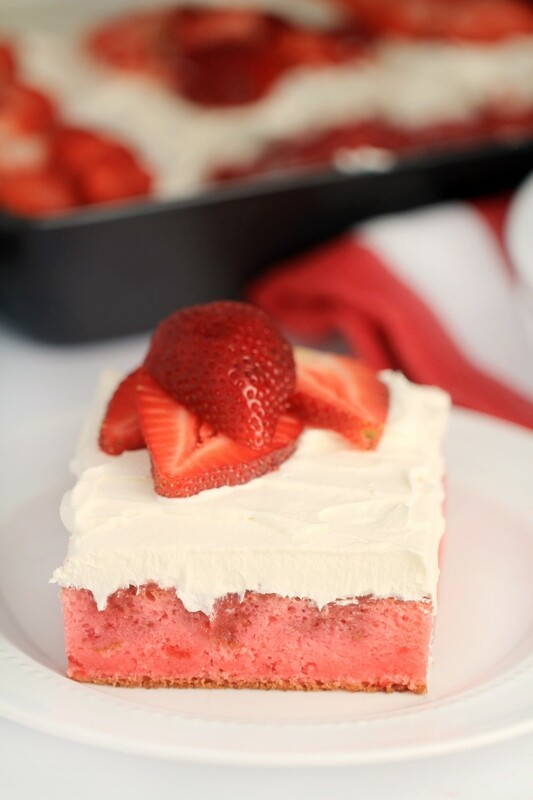 Fresh strawberries make this the most delicious strawberry cake you’ve ever had! 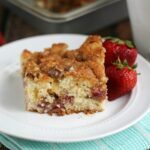 I love strawberry shortcake, but this strawberry poke cake blows that out of the water with all the strawberries in this recipe. 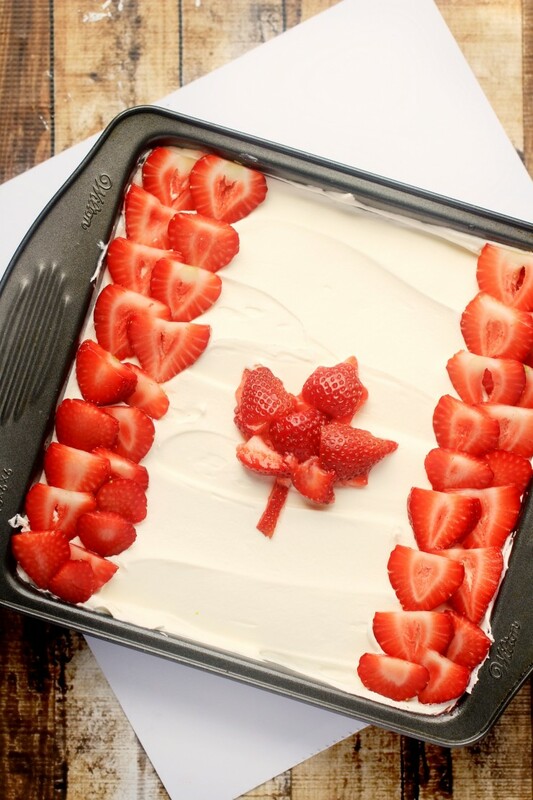 It’s perfect for celebrating Canada Day – and easy to decorate with the Canadian flag if desired. I used two rows of sliced strawberries on each side. Then I made a pile of strawberries in the rough shape of a maple leaf and then used my maple leaf cookie cutter to get the shape just right. I transferred the strawberry leaf to the cake carefully with a chefs knife. Isn’t it pretty? Nobody will believe how easy this cake is to make, or that it isn’t from scratch. 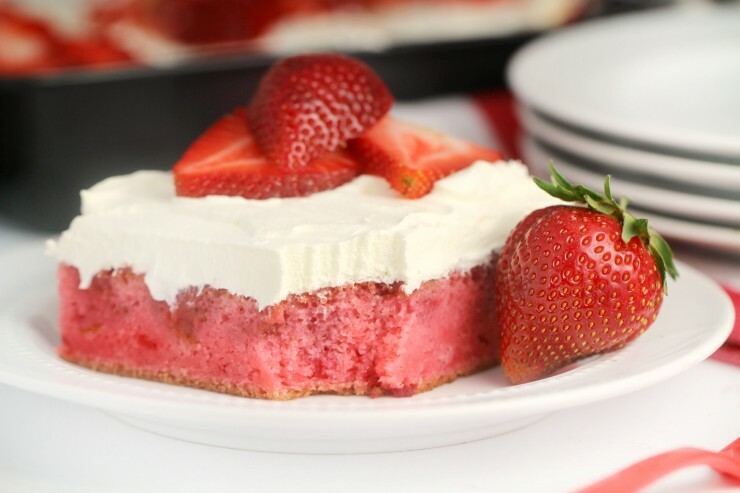 Of course, if you have a favourite Strawberry cake recipe you can sub that in too! 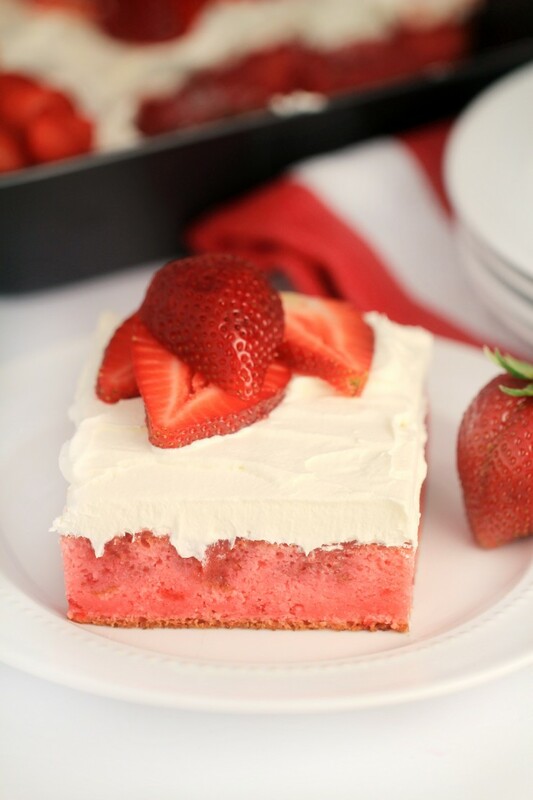 The sweeter the strawberries you use, the better this cake will end up. 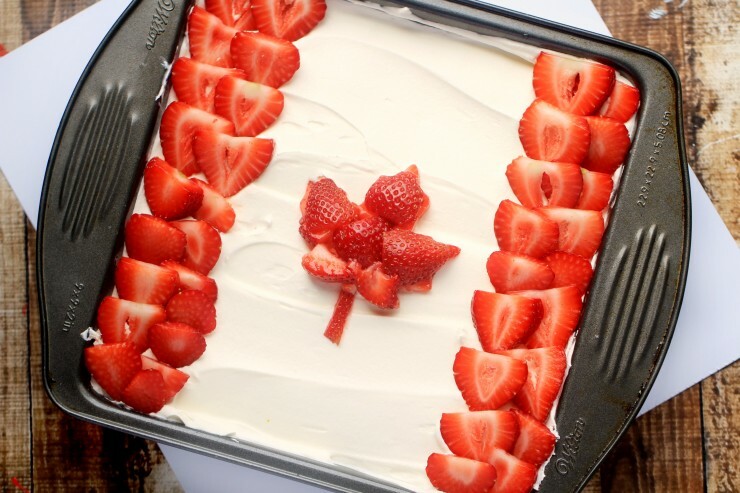 I am looking forward to making this over again on Canada Day with fresh Ontario strawberries because the California strawberries you can get year round don’t even compare when it comes to flavour. Mmmm! I used whipped topping, which isn’t something I normally buy, but I find that for desserts like this that real whipped cream doesn’t hold up well unless you intend on serving immediately. Preheat oven to 350ºF. 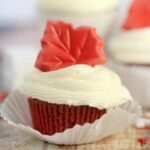 Grease and flour 9″x 9″ pan if using cupcake mix, or a 9″x13″ pan if using cake mix. Prepare mix according to directions and pour into prepared pan. Bake 24 minutes or until a toothpick inserted in centre comes out clean. 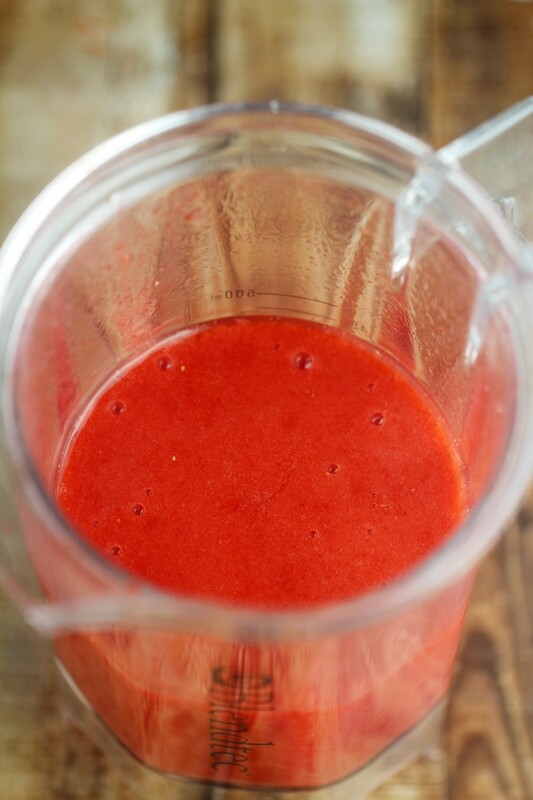 Meanwhile, puree 1.5 cups sliced strawberries with the honey, until smooth. 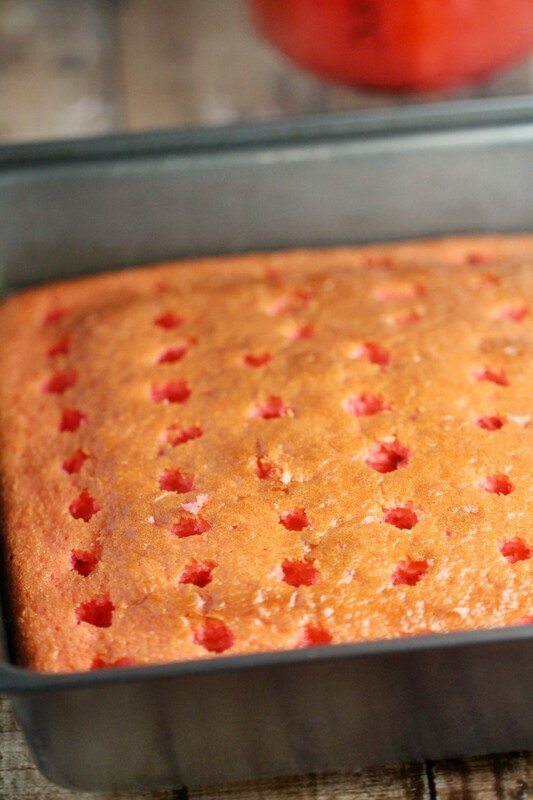 Poke holes 1/2″ apart in top of cake using handle from wooden spoon while the cake is still hot. 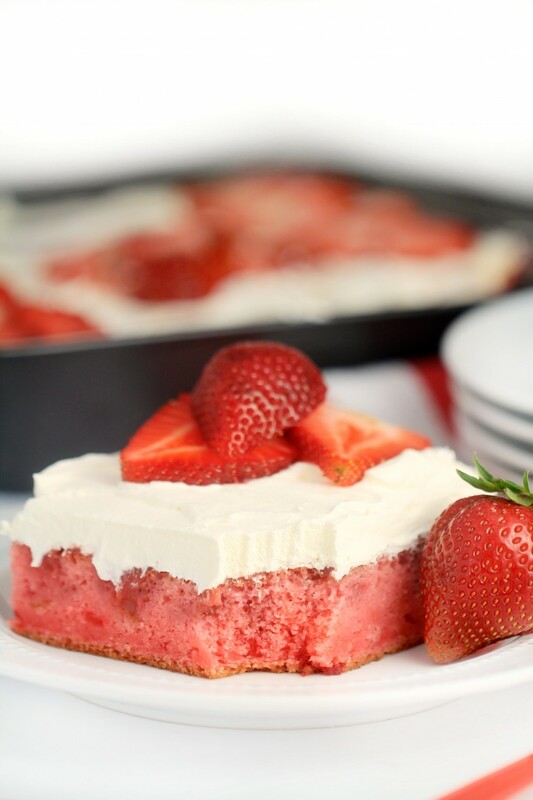 Slowly spoon strawberry puree over top of the cake, ensuring the puree fills the holes; chill at least 4 hours. 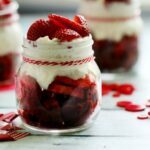 Spread whipped topping on cake and garnish with remaining strawberry slices. Store any leftovers in refrigerator. Preheat oven to 350ºF. Grease and flour 9"x 9" pan if using cupcake mix, or a 9"x13" pan if using cake mix. Poke holes 1/2" apart in top of cake using handle from wooden spoon while the cake is still hot. 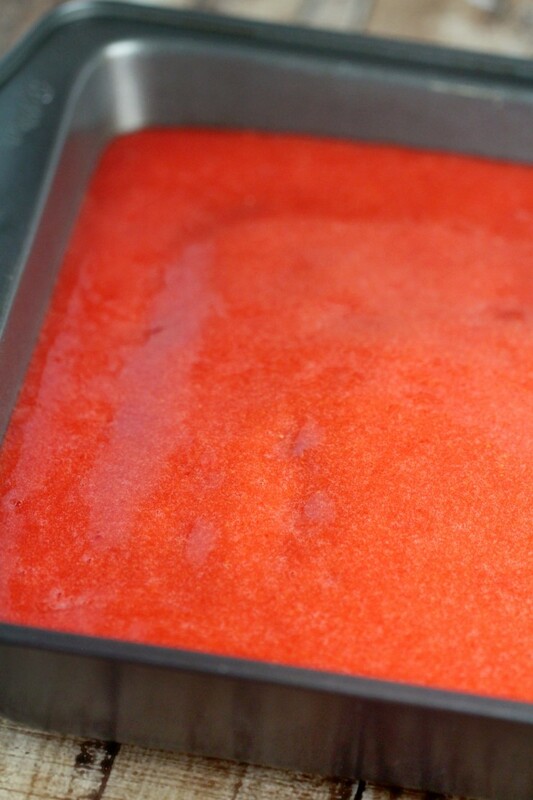 Slowly spoon strawberry puree over top of the cake, ensuring the puree fills the holes; chill at least 4 hours.